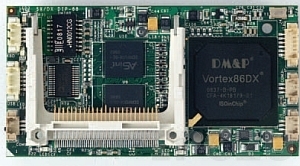 The VDX3-6754 is based on aVortex86DX3 SoC CPU with a clock rate of 1GHz and available with 1GB or 2GB of DDR3 RAM. Up to two monitors in dual-display mode can be connected via VGA and LVDS interfaces. The maximum resolution for VGA is 1920x 1080@60Hz(18-bit/24-bit) and 1024x768@60Hz(24-bit) for LVDS. 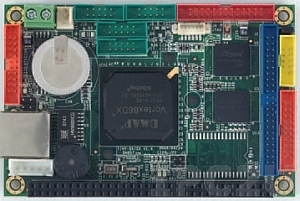 Multiple interfaces like programable 8xDigital In/ 8xDigital Out GPIO, LAN, audio, two USB and four RS-232/485 COM make the VDX3-6754-2C-2G the ideal board for OEM-purposes and a great choice for the use in real industrial embedded applications, that demand an extremely long availability. The board is powered by 5VDCin at a typical current of 1.3A (roundabout 6.5W power consumption). Its standard operating temperature without additional CPU-cooling ranges from -20°C to +70 °C, however wide range versions from -40°C to +85°C are available as well. 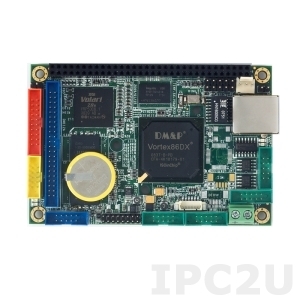 IPC2U will be pleased to support and assist you in the development process of your embedded system or application by providing you with samples for testing and prototyping. Besides Windows XP and Windows 7 (Embedded Standard 8, Embedded Compact 7, Embedded 2009) the VDX3-6754-2C-2G can also operate under DOS, Linux, QNX, VxWorks and FreeBSD.